Members of the Richmond Evangelistic Center in Virginia recently had a grand opening celebration in honor of their new church facility. The officers of the Potomac Conference, representatives from local government, members of Maranatha Volunteers International (which helped build the facility), and members of area churches—more than 500 people in all—came together to dedicate the facility to the Lord. 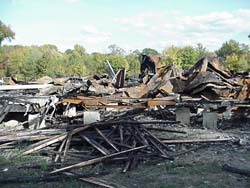 Right after the September 11, 2001 tragedy, their previous facility was burned (see photo). But what a blessing! What the enemy did to discourage and fill the hearts of the members with fear, the Lord transformed with a much greater blessing. Their new space (pictured) has plenty of room for events and growth. Now that their new facility is complete, Pastor Liñián Olivera and his congregation are committed to an ambitious outreach program. They will work as hard as they did, or even harder, to build not a material facility, but the spiritual kingdom of God. Their plan is to plant four new congregations in the Richmond Metro area. From Ashes to Victory: The Richmond Evangelistic Center in Virginia had a grand opening celebration of their new church facility April 5. The officers of the Potomac Conference, representatives from the government, members of Maranatha, and members of area churches—more than 500 people—joined to praise God. Right after the September 11, 2001 tragedy, their previous facility was burned. But what a blessing! What the enemy did to discourage and fill the hearts of the members with fear, the Lord transformed it in a much greater blessing. Grand Opening - Now that their new facility is complete, Pastor Liñián Olivera and his congregation are committed to an ambitious outreach program. Now they will work as hard as they did, or even harder, to build not a material facility, but the spiritual kingdom of God. Their plan is to plant four new congregations in the Richmond Metro area. 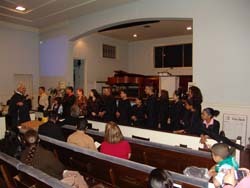 Columbus Church Plants – This is a photo of the 14 people baptized after my week of harvest in Columbus, Ohio. The local Hispanic leadership, in conjunction with the current Hispanic congregation, have laid out a plan for the next three years to plant four new churches in the Columbus Metro area. The objectives are to take the tithes from $130,000 to $300,000; membership from 125 to 450; and to plant three new Hispanic mission churches and one Portuguese mission church. The strategy is based on training, tooling, and inspiring every believer according the spiritual gifts they have to do faithfully what the Lord is calling us to do. Beside this, the plan calls for an aggressive small group ministry and a continuous evangelistic process of seeding and harvesting. I am overjoyed to see leadership and believers united and excited as disciples of Christ to commit themselves to the mission of the church. Great Expectations for Pennsylvania-Hispanic church leaders recently held their annual lay festival at Strasburg, Pa. More than 250 attendees listened to Carlos Martin’s seminars about the principles of church growth and discipleship. We felt the presence of the Lord. 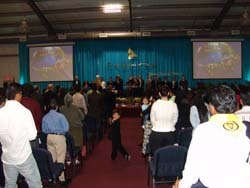 At the end of the meetings, pastors and church lay leaders set the goals for 2008. Pastor Juan Lopez, conference Hispanic coordinator, reported the total of baptisms and small groups that the churches will work for as 375. 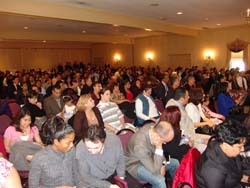 It is inspiring to see their enthusiasm and commitment to bring souls to Christ.